An explorer goes into an undiscovered tomb for the first time, and in the center of the tomb there is a lamp. So he picked it up and started to rub the dirt off of it, and out came a genie out of the lamp and he said "I want to know the person you hate the most" The explorer said "That's gotta be my ex-wife. Why?" "I am a cursed genie, I will grant you three wishes but whatever you wish for your ex-wife will get double the amount." "OK, I wish for a billion dollars" "Granted, but your ex-wife gets two billion" "I wish for a mansion in California with a swimming pool, and tennis courts, everything" "Granted your ex-wife gets two. 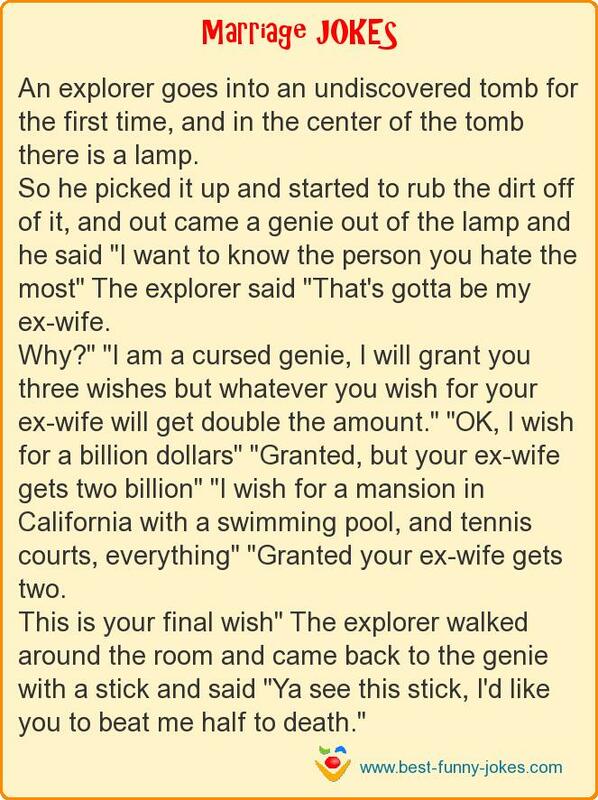 This is your final wish" The explorer walked around the room and came back to the genie with a stick and said "Ya see this stick, I'd like you to beat me half to death."